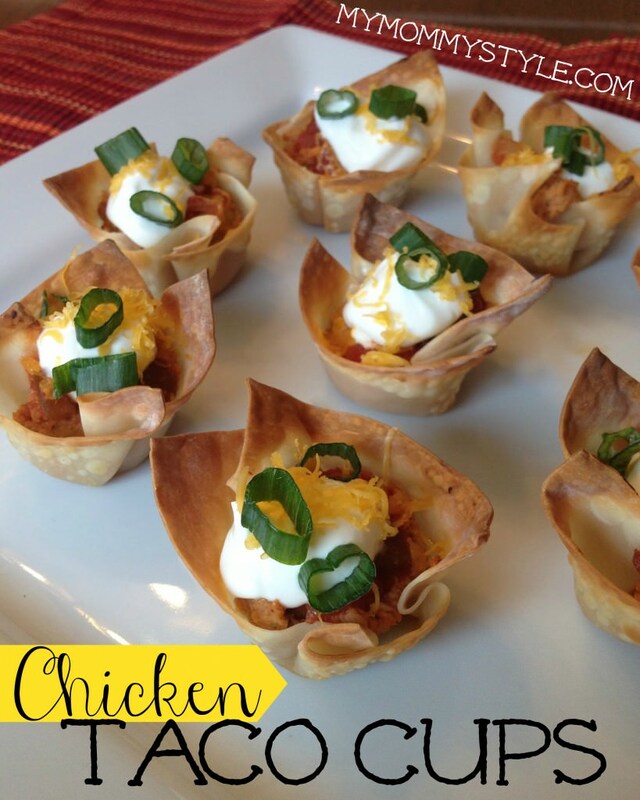 These little taco cups are so good and pretty easy to prepare. We’ve tried a few different toppings and I think my favorite is salsa, cheese, sour cream, green onions, and shredded lettuce. Also, as a word of warning, the recipe states putting the cooked chicken in a food processor. Do just that. Don’t make the mistake I did and put it in a high powered blender. I made the chicken the consistency of refried beans. It still tasted okay, but the texture was so weird AND it looked like dog food. If you have time it might even taste better to add the chicken, salsa and taco seasoning to a crock pot and cook it on low for 5-6 hours. The chicken will shred right up and stay moist and delicious. Sprinkle chicken with taco seasoning. Spray a large skillet with cooking spray, add the chicken and cook over medium heat stirring constantly until the chicken is no longer pink, about 5 minutes. Transfer cooked chicken to a food processor; cover and process until chopped. In a large bowl, combine the chicken, half of the salsa and 1/2 cup cheese. Spray a miniature muffin pan with cooking spray and press wonton wrappers into the cups. Bake at 375° for 5 minutes or until lightly browned. Spoon rounded tablespoonfuls of chicken mixture into cups; top with remaining salsa and cheese. Bake 15 minutes longer or until heated through. Serve warm. Garnish with sour cream, green onions, shredded lettuce and olives if desired.